Claude Houghton Oldfield (1889-1961) wrote a number of novels under the name of Claude Houghton, some of which had fantastic elements. These are discussed by Brian Stableford in the Encyclopedia of Science Fiction: they include his first novel, Neighbours (1926), whose narrator is obsessed about his neighbour, not realising that he himself is merely an facet of this man’s mind; Julian Grant Loses his Way (1933), which is a posthumous fantasy (that is, the protagonist is dead); and This was Ivor Trent (1935), which is arguably science fiction, since it looks at a writer who has a vision of the future. He wrote other novels, such as I Am Jonathan Scrivener (1930), which gained him a good deal of praise from critics and fellow-writers, but not a great deal of public recognition. Little seems to be known of Houghton’s life: there is no entry in the Oxford Dictionary of National Biography, and no biography. He was born in Sevenoaks in Kent, and educated at Dulwich College, after which he was trained as an accountant. 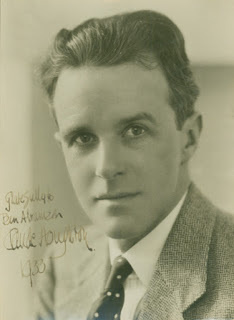 After the war he married Dulcie Benson, an actress, and lived in the Chilterns. He died in Eastbourne.